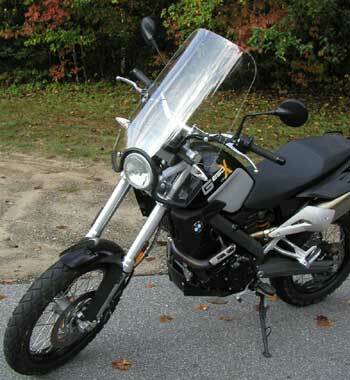 In October 2007, BMW of North America dropped off a new X-Country motorcycle to Parabellum Ltd. for windshield development. This project was initiated by Ron McMillan, a Scot living and working in Bangkok Thailand, whose plan is to circumnavigate the 48 continental United States and do a documentary film about the quest. His film project is continuing. Parabellum is now selling the exact same X-Country Sport Touring shield.The windshield is made from D.O.T. approved 5mm (3/16 in.) thick cast military aircraft grade acrylic for optical clarity and is 19 inches wide. * We discovered something interesting in our fuel economy testing: A 20 degree reduction in ambient temperature yielded a 10% reduction in fuel economy: The standard, unmodified X-country achieved 67 mpg at 80 degrees F., but only got 61 mpg at 60 degrees F. The 81.5 mpg test was conducted at 80 degrees F. Why the difference? Air density: The air is thicker at lower temperatures. Amazingly we never noticed this effect in all of our previous California testing. The ambient temperature on our previous Central California Coast test loop never varied much. As you know, I took Parabellum up on the 30 day return challenge regarding better gas mileage. I never really expected to return the windshield because I wasn't getting great gas mileage but I was certainly curious as to what the increase would be, if any. Well I didn't get 87mpg but I did get 85mpg with and average of 78mpg on a 2,000 trip! 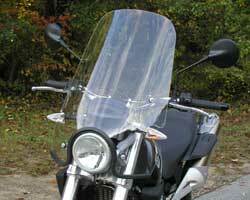 I can say without hesitation that the Parabellum is the best windshield I have owned and I have had many windshields over the years. 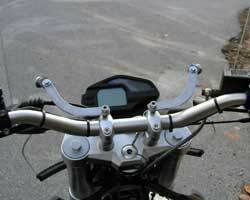 I'm very impressed with the windshield and the very clean and sturdy mounting system. Now that BMW has lowered the seat height on the X Country I'm sure they will be selling a lot more of them which should equate to more sales of your windshield. I did a lot of research before I selected Parabellum and you by far have the best product.